Hospitals provide complete healthcare, ranging from diagnostic services to surgery and continuous nursing care. Some hospitals specialize in treatment of the mentally ill, cancer patients, or children. Hospital-based care may be on an inpatient (overnight) or outpatient basis. The mix of workers needed varies, depending on the size, geographic location, goals, philosophy, funding, organization, and management style of the institution. Hospitals employ workers with all levels of education and training to provide a wider variety of services than other segments of the health services industry. About 1 in 4 hospital workers is a registered nurse. Hospitals also employ many physicians and surgeons, therapists, and social workers. Many workers in the health services industry are on part-time schedules. Students, parents with young children, dual jobholders and older workers make up much of the part-time workforce. 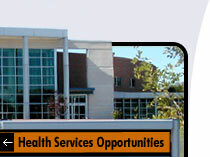 The health services industry provides many job opportunities for people without specialized training beyond high school. A variety of programs after high school provide specialized training for jobs in health services. Students preparing for healthcare careers can enter programs leading to a certificate or a degree at the associate, baccalaureate, professional, or graduate level. Two-year programs resulting in certificates or associate degrees are the minimum standard credential for occupations such as nurse, dental hygienist or radiologic technologist. Most therapists and social workers have at least a bachelor's degree. Physicians and surgeons have significant additional education and training beyond college. Persons considering careers in healthcare should have a strong desire to help others, genuine concern for the welfare of patients and clients, and an ability to deal with diverse people and stressful situations. Some hospitals provide on-the-job training or classroom training, as well as tuition assistance for continuing education. They do this in return for a promise to work for a particular length of time in the hospital after graduation.